This week's Diva Challenge is to keep it simple. So I simply used a standard Zentangle® tile, black and white, one tangle that involves two basic shapes and a spiral string. The challenge was that it was a new tangle... AKOYA by Sandy Hunter. Check out her instructions here if you haven't seen it yet. I think Sandy's examples are perfect for this week's challenge! I had to work a little to come up with something a little different! Happy Christmas and a Merry New Year to you. Fun simple (but not) tile! 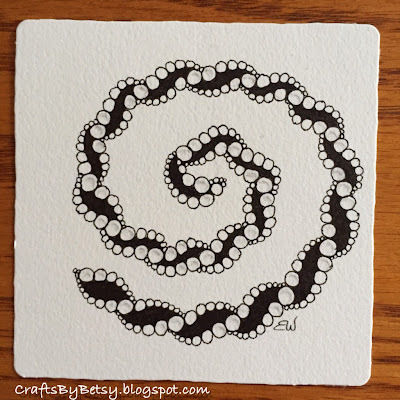 I really like this tangle and your rendition of it. Best wishes for a Merry Christmas and a happy New Year. This reminds me of a pearl bracelet that I have! Beautiful work! Very nice monotangle. Simple yet elegant. Have a Happy Holiday! Beautiful tile. Akoya is lovely. Happy Holidays. This is an amazing take on Akoya. Nice use of Akoya. Not sure when I will venture to use this tangle. Looks very much like a beaded necklace.